Day 23 of my Lancashire Boundary Walk. Up nice and early. Susan has brought me to Preston Railway Station for the 7.03 to Lancaster then onwards to Barrow and Foxfield. Sadly the Trans-Pennine Express is delayed and not expected until 7.20. The train to Barrow is 7.33! Not good as I have a long way to walk today. Having meal at The Queens Arms in Biggar, Walney Island. Walney is the most western point of Lancashire. Friends of Real Lancashire placed a plaque on the wall of this pub a few years ago. Day 24 of my Lancashire Boundary Walk. I’ve spent a night at the Queens Arms on Walney Island so this will allow me to get walking early after breakfast. I will walk the 2 miles back to Barrow via Jubilee Bridge then through the town to the coast at Rampside. It’s a long coastal route then virtually all the way to Ulverston from where I will catch the train back to Preston. Day 25 of my Lancashire Boundary Walk in aid of NW Air Ambulance. So first stop at Lancaster and I changed for the Northern Rail rickety train to Ulverston. The Furness Line through Carnforth, Silverdale, Arnside, Grange over Sands, Kent’s Bank and Cark is wonderfully scenic. I do love these walks coupled with a train journey. I’ve been very fortunate in that most of journeys to the boundary has involved a train. 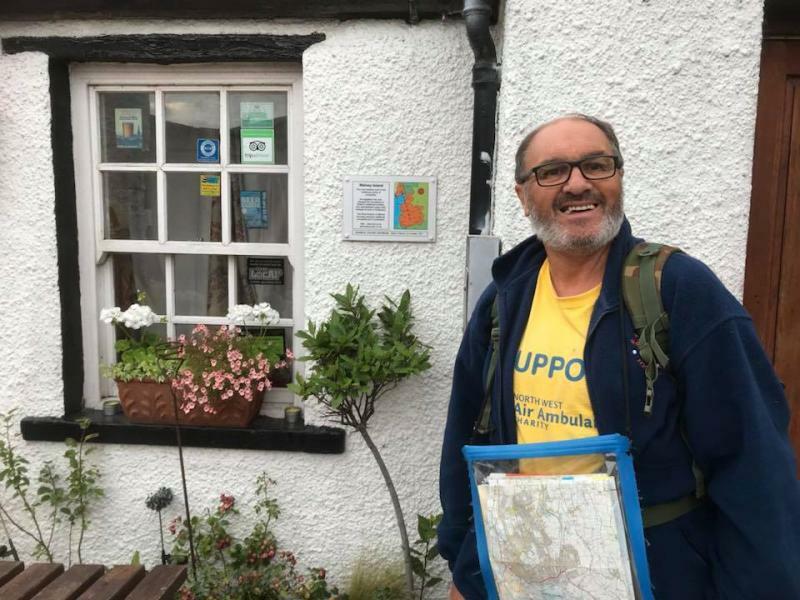 I will arrive in Ulverston at 9.04 (train delayed now 9.20) and make my way to Canal Foot again from where I will walk to Cark & Cartmel via Greenodd. Hope I’m not boring you! With over 80 likes yesterday, I must be doing something right! Tomorrow, I will hopefully walk from Cark to Grange-over-Sands and if time, I may do the Silverdale coast. Thanks for your support folks. Good morning folks, I’ve had a later start as the first train out of Preston for a connection to Cark was not until 9.23. Susan brought me to the station. So far so good, the train was on time and we arrived at Lancaster about 17 mins later. Unfortunately the train to Barrow was cancelled due to shortage of drivers and we’ve had to wait until 11.06. A bit of a pain but there’s no great rush today as the walk is not as long. For all this time, I’ve been talking to a new friend Geoff Sherrocks of Formby and a committee member of Lancashire Rail Ramblers who should have gone on Dales Rail but cancelled due to shortage of drivers. He decided then to go to Roose to walk in that area. A wonderful conversation Geoff and thanks. I may join you on a future Rail Ramble. I just missed a train by minutes, so I’m having to have a pint in the Commodore Inn at Grange-over-Sands. I’ve walked for 6 hours today. Very enjoyable walk, not too difficult. So booking off for today. I am having 3 days off. Actually on Wednesday, I’ll be with the Friends of Real Lancashire stand at Ulverston Show and will he joined by William Lloyd. I’ll resume the final “run in” to Blackpool Tower on Thursday, starting off from Silverdale and finishing in Morecambe. Today I walked 10.5 miles in 6 hours. In 7 days in the Lakes, I walked 104 miles.